The riverside neighbourhood of Putney seems to have it all. Open green spaces? Check. Cultural hub? Check? Live music scene? Check. Not to mention all the fun of the Boat Race every year. But if you want to make the most of your time there – whether you are a longstanding local or have just popped in for a visit – we have the ultimate Putney guide. So, firstly, the Boat Race. Also known as the University Boat Race and the Oxford and Cambridge Boat Race, the first men’s competition was held in 1829, the women’s in 1927. Read more on the history here. The annual event brings revellers to the riverside to watch the spectacle and the embankments are packed. Want to know the best ways to join in the fun? We have the top five Boat Race events for you to check out, with some of the fantastic local pubs hosting entertainment. The area is not short of fantastic restaurants either. Whatever you fancy to eat, Putney can pretty much provide. Don’t miss Putney Pies, which has a deserved reputation for tasty pastry. There’s also Pinto Thai for something spicy. We also love Isola Del Sole for incredible Sardinian dishes. Gazette Putney is the perfect place, meanwhile, for great French food. For more recommendations, don’t miss our guide. And if you are looking for a pre or post-dinner drink, see our tips for top pubs and bars. So, need to walk off a hearty lunch? Putney has plenty of options. Head to the beautiful wild expanse of Putney Common or simply stroll along the river. We have an extensive guide on what to do in the area – you can even try a spot of paddleboarding. There’s mini golf and tennis courts for hire over in Wandsworth Park. And Putney Bridge has loads of great attractions too. Take a stroll to Fulham Palace, a treasure not to be missed. Into the evening, there’s plenty going on with live music and theatre. 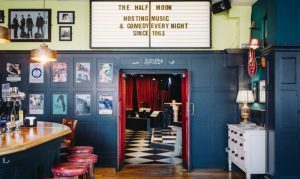 Check out the The Half Moon with music and comedy and Putney Arts Theatre for a selection of plays. For history buffs, the area has a fascinating past, which goes back to Neolithic times. There has been a ferry crossing at Putney since the Romans, with a wooden toll bridge built in 1729. During the Civil War, Cromwell’s army was located in Putney – the subsequent discussions on government by the Army Council became known as the Putney Debates, and resulted in significant progress in British democracy. St Mary’s Church has an exhibition where you can find out more. Wandsworth Council links to some fascinating insights on Putney’s heritage, including listed buildings, notable graves and Blue Plaques – including that of Henry VIII’s chief minister Thomas Cromwell, who was born in Putney, believed to be in the vicinity of Brewhouse Lane.